Hello Linux Geeksters. As you may know, Haroopad is a cross-platform, markdown enabled document processor ideal for authoring blog posts, slides, presentations or emails. It has a Mathematics Expression, syntax highlighting for various programming languages and can export your content to WordPress, Tumblr, MediaWiki, EPub, ReStructured Text, RTF. The latest version available is Haroopad 0.12.2, which has been released a while ago. 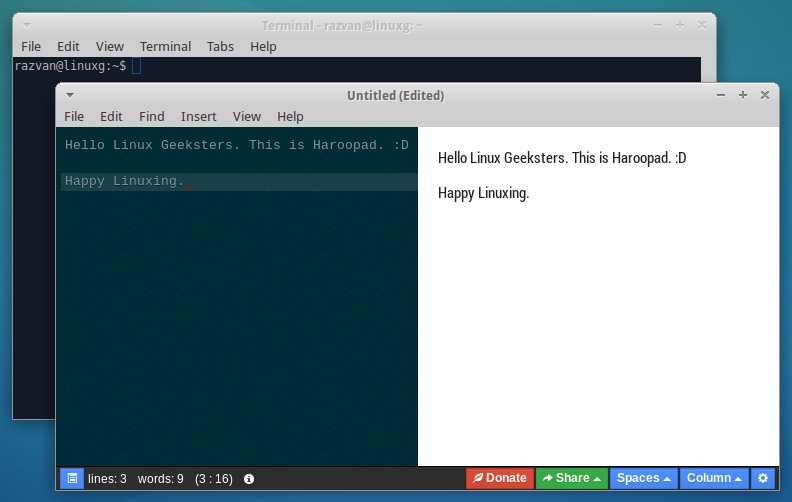 In this article I will show you how to install Haroopad 0.12.2 on Ubuntu, Linux Mint, Pinguy OS, Elementary OS, Deepin, Peppermint, LXLE, Linux Lite, Debian, Kwheezy, SparkyLinux and other Ubuntu and Debian derivative systems. Because it is not available via any repository, we have to download the deb package from the project’s website and install it via command-line. Follow the instructions for your system’s architecture exactly, in order to get a successful installation.